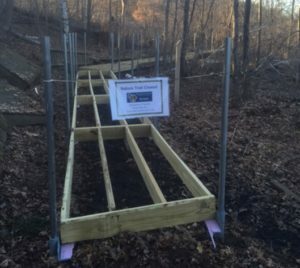 2016 marked a re-birth of the Nature Trail for the Menomonie Lions Club. 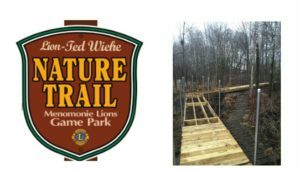 Lion Ted Wiehe organized the building of a wood nature trail back in the 1960’s at the Menomonie Lions Game Park. To build the original path Ted scavenged materials from his church and local lumberyard for cutoff materials. 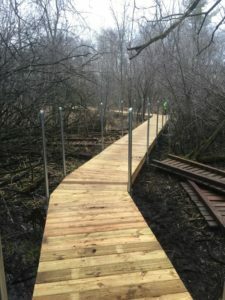 Over the years Ted and the Nature trail committee worked to level and repair the path. The late Lion Ed Lowery identified trees/natural resources to make it an educational experience on the walk around Ted’s wood path. 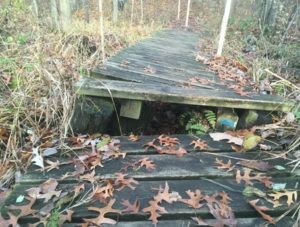 As he advanced in age, it became hard to keep up with the repairs necessary to maintain the walkway and it fell into poor repair. In the fall of 2015 a group representing National Science Olympiad at Stout came to our general meeting asking for assistance for their upcoming event in May of 2016. They also mentioned they would like to bring a group of 5000 people from all over the United States through our Lions Game Park and down our nature trail. This upcoming event was the push the club needed to springboard the revitalization of the Lions Nature Trail. Lion Collin Thatcher had taken interest in the nature trail years prior trying to navigate it with his young children in strollers and found it to be very difficult and dangerous. Collin researched online for potential nature trail designs and settled on a dock and post setup to go over the swampy conditions. Local fence contractors were contacted, costs compiled, and a final plan was presented. The club approved the $16,000 project in December and in January the posts were pounded by American Fence out of Chippewa Falls. 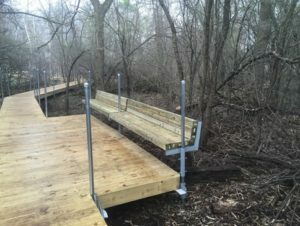 The month of February marked the building of the dock sections thanks to assistance from Pro Build Menomonie on getting us prime material at a great cost and fasteners from Fastenal donated and sold to us at reduced price. March was unseasonably warm and allowed for the dock sections to be set and decked. The month of April allowed for final touches to be made. The project is a month ahead of schedule and stayed right on budget. 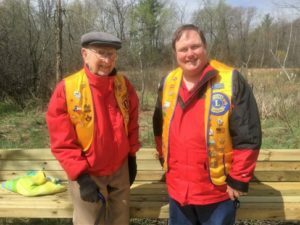 Throughout the process, 97 year old Ted Wiehe attended a majority of the club meetings where Collin would give updates on progress and hold nature trail committee meetings to plan for the weeks ahead. Progress phone calls and emails were also shared to keep Ted in the loop. A few weeks back Collin brought Ted out to visit the trail and he was thrilled with the final results. Better than he could ever dream. Teds Legacy now lives on due to the wonderful support from the Menomonie Lions Club and the awesome work completed by the Nature Trail committee. Come down to the Lions Game Park and check out the trail. Sit on the benches and enjoy nature. Signs indicating tree types are all over the path as a guide to your walk. Sit still on the benches and you might be lucky enough to see the wild whitetails and many other animals right in the heart of town. It is truly a diamond in the rough and worth the trip out to see. A grand re-opening will be held in June and a chamber of commerce ribbon cutting shortly. Look to our Website and Facebook for updates on that.